We give below three forms of breath, quite popular among the Yogis. The first is the well-known Yogi Cleansing Breath, to which is attributed much of the great lung endurance found among the Yogis. They usually finish up a breathing exercise with this Cleansing Breath, and we have followed this plan in this book. We also give the Yogi Nerve Vitalizing Exercise, which has been handed down among them for ages, and which has never been improved on by Western teachers of Physical Culture, although some of them have “borrowed” it from teachers of Yogi. We also give the Yogi Vocal Breath, which accounts largely for the melodious, vibrant voices of the better class of the Oriental Yogis. We feel that if this book contained nothing more than these three exercises, it would be invaluable to the Western student. Take these exercises as a gift from your Eastern brothers and put them into practice. The Yogis have a favorite form of breathing which they practice when they feel the necessity of ventilating and cleansing the lungs. They conclude many of their other breathing exercises with this breath, and we have followed this practice in this book. This Cleansing Breathing ventilates and cleanses the lungs, stimulates the cells and gives a general tone to the respiratory organs, and is conducive to their general healthy condition. Besides this effect, it is found to greatly refresh the entire system. Speakers, singers, etc., will find this breath especially restful, after having tired the respiratory organs. Retain the air a few seconds. Pucker tip the lips as if for a whistle (but do not swell out the cheeks), then exhale a little air through the opening, with considerable vigor. Then stop for a moment, retaining the air, and then exhale a little more air. Repeat until the air is completely exhaled. Remember that considerable vigor is to be used in exhaling the air through the opening in the lips. This breath will be found quite refreshing when one is tired and generally “used up.’ A trial will convince the student of its merits. This exercise should he practiced until it can be performed naturally and easily, as it is used to finish up a number of other exercises given in this book, and it should be thoroughly understood. The efficiency of this exercise depends greatly upon the speed of the drawing back of the fists, and the tension of the muscles, and, of course, upon the full lungs. This exercise must be tried to be appreciated. It is without equal as a “bracer,” as our Western friends put it. Without going deeply into the Yogi theories of sound-production in speaking and singing, we wish to say that experience has taught them that the timbre, quality and power of a voice depends not alone upon the vocal organs in the throat, but that the facial muscles, etc., have much to do with the matter. Some men with large chests produce but a poor tone, while others with comparatively small chests produce tones of amazing strength and quality. Here is an interesting experiment worth trying: Stand before a glass and pucker up your mouth and whistle, and note the shape of your mouth and the general expression of your face. Then sing or speak as you do naturally1 and see the difference. Then start to whistle again for a few seconds, and then, without changing the position of your lips or face , sing a few notes and notice what a vibrant, resonant, clear and beautiful tone is produced. The following are the seven favorite exercises of the Yogis for developing the lungs, muscles, ligaments, air cells, etc. They are quite simple but marvelously effective. 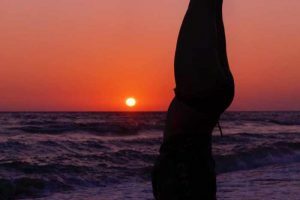 Do not let the simplicity of these exercises make you lose interest, for they are the result of carefuI experiments and practice on the part of the Yogis, and are the essence of numerous intricate and complicated exercises, the non-essential portions being eliminated and the essential features retained. (2) Place the hands one on each side of the body, as high up under the armpits as convenient, the thumbs reaching toward the back, the palms on the side of the chest and fingers to the front over the breast. The chest is quite apt to be contracted from bending over one’s work. This exercise is very good for the purpose of restoring natural conditions and gaining chest expansion. (6) Then bring back to Position 4, and swing to Position 5. Repeat. (2) Inhale a Complete Breath, counting (mentally) I, 2, 3, 4, 5, 6, 7, 8, one count to each step, making the inhalation extend over the eight counts. (3) Exhale slowly through the nostrils, counting as beforeâ€”I, 2, 3, 4, 5, 6, 7, 8â€”one count to a step. (4) Rest between breaths, continuing walking and counting, I, 2, 3, 4, 5, 6, 7, 8, one count to the step. (4) Slowly sink to the first position, at the same time slowly exhaling the air through the nostrils. This exercise may be performed without the use of a stick or cane, by grasping an imaginary cane, using the will to exert the pressure. The exercise is a favorite Yogi plan of stimulating the circulation by driving the arterial blood to the extremities, and drawing back the venous blood to the heart and lungs that it may take up the oxygen which has been inhaled with the air. In cases of poor circulation there is not enough blood in the lungs to absorb the increased amount of oxygen inhaled, and the system does not get the full benefit of the improved breathing. In such cases, particularly, it is well to practice this exercise, occasionally with the regular Complete Breathing exercise.